More than £20m is being invested by the public and private sectors in Newry city centre. Financial technology firm First Derivatives is due to open its second major hub in the city, while Newry, Mourne and Down Council has also announced building plans. It is expected that the new facilities will bring in hundreds of workers each day. The First Derivatives hub will be based beside the cathedral. Meanwhile, the council has plans to build a theatre, a civic centre and a new park. Such investments are also attracting housing back into the city centre. Facing the new First Derivatives' offices on Hill Street is the city's former post office. At present there are plans to convert this building into 18 apartments. The council investments will be worth well in excess of £20m. The overall final value of the private sector construction has not yet been revealed. Such developments are being viewed as a means of shaping a new future for a town centre badly damaged by poor town planning in the 1960s and 70s. This saw the demolition of hundreds of homes to make way for a dual carriageway. High rise flats followed, although they are now mostly demolished. Following the closure of Newry Port in the 1970s, the city's canal fell into a state of serious disrepair. Low bridges were erected blocking any form of transit on the historic waterway and a one-way system was introduced in the island area between the Clanrye River and Canal. The development of the Buttercrane and Quays Shopping Centres on the Armagh side of the city saw more and more of Newry's retail activity take place away from Hill Street on the County Down side - despite regular cross-border shopping booms. Eamonn Connolly of Newry Business Improvement District is one of a number of people working to reshape the city. He was once County Down's Gaelic football goalkeeper. He also built a modular hotel in a Warrenpoint Industrial Estate and shipped it to the Shetland Islands. It is this capacity for imaginative solutions that Mr Connolly believes is at the heart of the city's regeneration proposals. "High streets have suffered with out-of-town and online shopping," he said. "We all realise that the High Street needs to do something to improve itself and revitalise itself. So this is a community offering, a work offering, a retail offering and a wider regeneration offering." The project is likely to lead to considerable debate over car parking. Not just because more people will be working in the city centre but because the civic centre will be built on the existing Cathedral car park. But Mr Connolly believes solutions can be found. "Car parking is an issue but is one we are constantly providing solutions to and the Council has said that with this redevelopment of the car park they will be providing solutions to replace the lost spaces," he said. 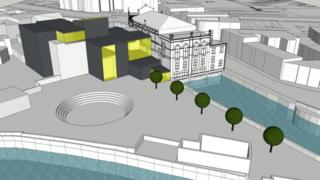 Among the most eye-catching parts of the regeneration plan is the development of a new theatre and conference centre. This will be located on a section of wasteland that sits behind the existing Arts Centre and Town Hall. Last year the Council spent in the region of half a million pounds upgrading these facilities. As such, the enhanced plans came as something of a surprise to the local arts community. Donal O'Hanlon of Newpoint Players said the investment is welcome, but more detail is required. "The Town Hall is an iconic building and is the one most associated with Newry," he said. "It makes an excellent concert hall but it wasn't built as a theatre. It is on a first-floor level. So any visiting production, of which there are few, have to lift all of their sets manually up a flight of stairs. "They want to roll a truck up at the back and just roll it into the theatre." He said that while the local theatrical community is delighted, it has no idea about what is proposed. "We remain optimistic that something will be provided that will be acceptable to amateurs and professionals alike," Mr O'Hanlon said. The council has said that it will appoint a full design team for the project early in 2019. Before that they say that they will engage with the arts community. The new First Derivatives offices will open in the coming weeks with the council projects expected to be completed by 2021.